دولف لاندجرين (سويدى:Dolph Lundgren), اتولد 3 نوڤمبر 1957, ده ممثل سويدى ومتخصص فى السينما وعنده فنون قتاليه بتوع البوكسنيج وغيره, اشتهر بتمثيل دور ايڤان دراجو الروسى فى فيلم روكى 4. ↑ Wales, George. "Confirmed: The Expendables 4 will arrive in 2017", www.gamesradar.com, published 10 December 2015. Retrieved 15 October 2015. ↑ Guerra, Victoria. "The Expendables 2015: 4th Installment Shooting Next Year, Which Mercenaries Return For Sequel? ", www.foodworldnews.com, published 10 December 2015. Retrieved 15 October 2015. ↑ Sundholm, John; Thorsen, Isak; Andersson, Lars Gustaf (31 August 2012). Historical Dictionary of Scandinavian Cinema. Scarecrow Press. p. 202. ISBN 978-0-8108-5524-3. Retrieved 27 November 2012. ↑ Green, Thomas A.; Svinth, Joseph R. (30 June 2010). Martial Arts of the World: An Encyclopedia of History and Innovation. ABC-CLIO. p. 541. ISBN 978-1-59884-244-9. Retrieved 27 November 2012. ↑ "Biography". 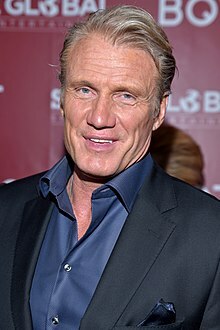 Dolph Lundgren.com (Official website). Archived from the original on 14 August 2011. Retrieved 22 May 2011. الصفحه دى اتعدلت اخر مره فى 12 يناير 2019,‏ 05:13.